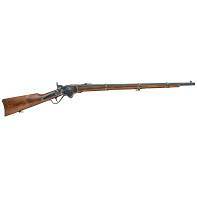 Designed by Christopher Miner Spencer, the Spencer rifle gained fame after being adopted by the Union Army during the American Civil War. 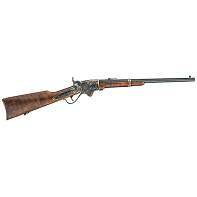 A manually operated lever action fed from a tube magazine in the buttstock, the Spencer rifle was a vast improvement over the muzzleloading rifles being used during the war. Chiappa Firearms' reproduction is manufactured from precision CNC parts precisely joined to beautiful, hand oiled walnut stocks. Color case finish receivers are joined to precision rifle barrels with a blued finish. Chiappa Firearms makes Spencer rifles in the original 56/50 or in the more easily obtained 45Colt.